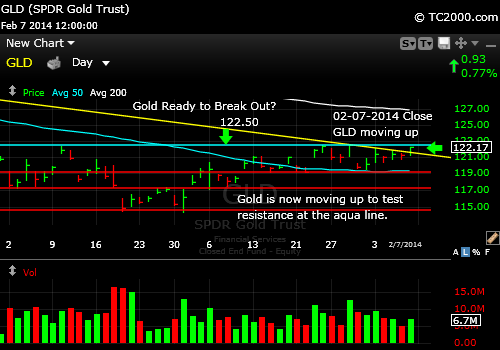 Market Timing Brief for the Gold ETF (GLD) and 10 Year Treasury Yield (TNX) Closes On 2-07-2014: Gold About to Break Out? Will Yields Continue Down? The yellow trend resistance line on the GLD chart I pointed out last Sunday was finally broken to the upside, but the top aqua resistance line must still be conquered by the gold Bulls. Gold is just itching to break out. NOTE: Breakout number is 122.51 not 122.50. As the chart below shows, the all important 10 Year Treasury Note yield (TNX, TLT) is rising a bit again. 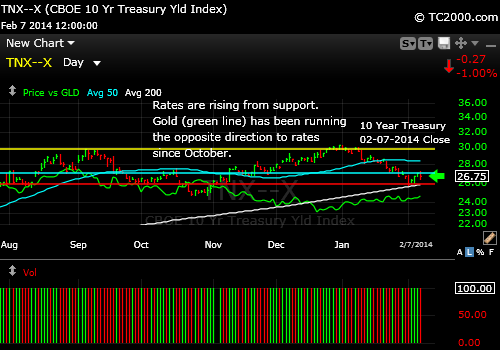 As you can see, gold does not always inversely correlate with the yield chart, but it has since October, move by move. If the yield keeps rising, this could prevent a breakout in gold above the aqua line in the 1st chart. I would check the interest rate chart before buying a gold breakout and if it’s moving WITH rather than AGAINST gold, watch your stops and make them tight or you may decide to wait a bit! In other words, we want gold to go UP and interest rates to head DOWN, or to understand why the correlation has changed from the latest one, which is an INVERSE correlation. The 10 Year Treasury Yield has moved against GLD since October. This entry was posted in Bonds, gold, investment, metals, Treasuries and tagged 10 year treasury, gld, gold etf, market timing, tlt, tnx. Bookmark the permalink.